Shrove Tuesday falls upon us on the 16th of February this year. Traditionally Shrove Tuesday was celebrated as the last indulgence before lent as pancakes contain butter and eggs, forbidden during this time of abstinence. So if you're going to indulge, do it properly! This post comes to you in two parts, today is a sweet recipe and tomorrow a savoury, oven baked version, both with an Italian twist. I produced both recipes for Morrisons, who gave me a few seasonal ingredients to work with as a base for a pancake recipe. For this version I received clementines and almonds. These sweet pancakes were inspired by my favourite pastries of all time, Sicilian cannoli. No matter how many I eat I just can’t get enough of these crisp, fried pastry tubes filled with sweetened ricotta and candied peel with the ends dipped in either crushed pistachios, chocolate curls or finished with a glace cherry. Gorgeous! 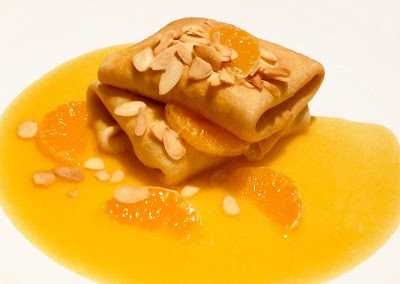 I decided to work the clementines and almonds into a sweet ricotta filling, the crunch of the pastry replaced with the texture of toasted almonds and clemetine sauce in place of the citrus candied peel. Although there seems to be quite a lot of stages just for some humble pancakes, each component is incredibly easy and quick. As the batter stands for 30 minutes, the filling and the sauce can be made. Alternatively the sauce can be made in advance. Make the Clementine sauce. Peel and segment the clementines. Place the sugar and water in a pan and bring to the boil. Continue to boil until the liquid has reduced by a third. Add the segments to this syrup and cook down for a couple of minutes. Leave to cool. Once cooled, blend to a purée. Pass through a fine sieve, reserving the liquid and discarding all the pith and segment skins. Make the filling. In a dry frying pan over a moderate heat, toast the almond flakes well (also toast the additional almonds for the garnish). Set aside. Place the ricotta in a bowl. Beat in the icing sugar, seeds from the vanilla pod, orange zest and nutmeg. Stir in the toasted almonds, keeping back those set aside for garnishing. Make the pancakes. Heat the butter in a 10cm frying pan. Ladle in just enough batter to thinly coat the base of the pan. Cook for a couple of minutes until golden. Turn (or flip if your fancy) and cook the other side. Keep the pancakes warm until you have made all eight. Assemble. Spoon an eighth of the ricotta filling in the middle of a pancake and fold the sides in to form a square parcel. Repeat with all the pancakes. 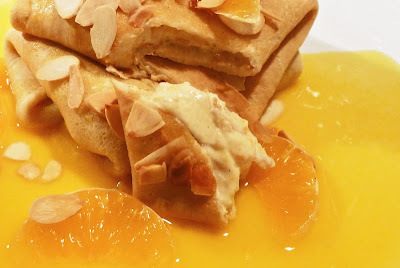 Place two pancakes on a plate per person, drizzle with the clementine sauce and top with the reserved toasted almond flakes and some clementine segments.